The latest issue of Dolce Vita magazine features the Jenkins “2009 Austin Dream Home” in an editorial discussing the epitome of luxury living…luxury homes. In an article entitled “Building Perfection”, the Editor sits down with Shan Jenkins, President of Jenkins Custom Homes, a custom home builder in Austin, to ask a series of questions about how he accomplishes the design and construction of such amazing homes. “As a leader in home design, this experienced builder creates remarkable dream homes from start to finish,” states Stephanie D’Angelo of Dolce Vita. “Unique and majestic, each home bursts with enchanting character and unparalleled design,” she says. “And what’s more, a Jenkins Custom Home always reflects the personality of the family who lives inside.” She discusses the Jenkins Lifestyle Analysis, a copyrighted system used to determine the lifestyle of each client which culminates in their beautiful custom home. She asked Jenkins if, as a child, he saw himself working in this industry. She then discusses Jenkins’ background in construction and what led him to this industry. “Jenkins’ fruition is rooted in his deep passion to create,” she says. “I approach each project with the mindset that it has to be built as close to perfect as possible,” she quotes him as saying. 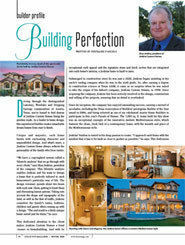 It is this pursuit of perfection that makes Jenkins Custom Homes “a front-runner in custom home building”, she writes. All in all, this article highlights the accomplishment of a company and a man dedicated to the pursuit of excellence in his industry and passionate about creating client’s dreams.